A lovely THREE DOUBLE BEDROOM townhouse located in a QUIET sought after AVENUE in North Swindon. The property benefits from TWO LARGE reception rooms, generous KITCHEN, PRIVATE rear GARDEN with GARAGE AND PARKING. The property MUST BE VIEWED to really appreciate all the SPACE ON OFFER. Entrance hallway, large dining room, wc, kitchen with space for centre island and range oven with access to the south facing rear garden. To the first floor is a large living room with two sets of Juliette balcony doors and feature fireplace and bedroom three which is a good sized double. 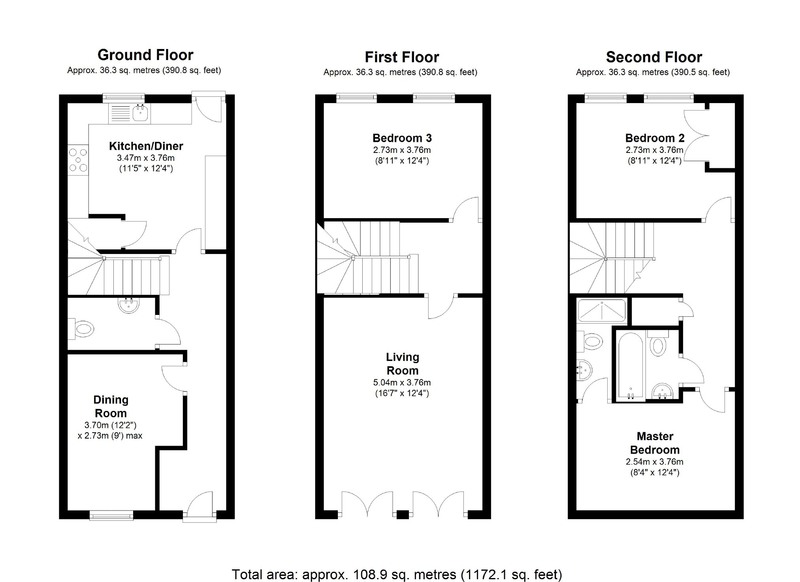 To the second floor is another double bedroom with built in wardrobes as well as a large master bedroom with built in wardrobes and lovely ensuite shower room. There is also a recently refreshed family bathroom which consists of a white suite. To the rear of the property is a bright and sunny south facing rear garden with decked area and access to the garage and driveway parking to the rear. Fenton Avenue is located a stones through from the Orbital Shopping park and offers a range of shops and restaurants.